its suposed to be just like/rebranded mora knives. go check it out! Found this great video with a few little tweaks to make this even more bushcraft friendly, have added it in the multimedia section but have embedded below as well. What a great knife, talk about bang for your buck! It is stainless clipper, on the back of the sheath is a sticker with mora clipper written on it. Can not beat them for value for money. I have 2 carbon versions and they are great. 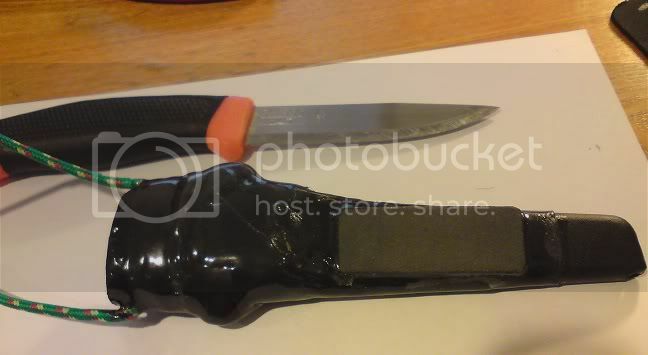 - Plastic Sheath from old crapy fake chinees mora knife fits bahco very snug! I'm currently rehandling one of those to use as my bait knife. I used a section of old axe handle and drilled an 8mm hole down the middle of it. You can break the knife out of a handle by securing it in a vice with the knife blade standing up then using a chisel to cut down the side of the blade, ensure you have the bevel side of your chisel against the blade so when the chisel breaks the handle your hands are well clear once it slips down, otherwise you will stab yourself in the hand. Do that on both sides. Wrap the blade in tape and crank the vice down as hard as you can with the rat tail tang sticking out of the side of the vice, the piece of timber you have drilled an 8mm hole in should slide on the tang easily until their is about 40mm left to go. Ensure you have the handle orientated the way you want it and use a mallet to drive it home the rest of the way, the start of the blade should dent the timber about 1mm once it has been driven home, be careful not to split the timber. I then filled the hole with linseed oil and because it was timber from an axe handle I decided to whittle parts of the wedge that went with the handle into wedges to plug the semi circular holes left either side of the blade. When you whittle them down the 2 pieces should resemble a split carrot with a slight taper, its a good idea to make them longer than the blade also so it makes it easier to mallet down into place. Use a fine saw to cut down the excess, I like a Bahco dovetail saw for things like this. after it is secured, coat with linseed oil again then you can shape the handle to suit or if you were ambitious enough even to fit the plastic bahco sheath. So on Friday I went to Bunnings in Te Awamutu. I asked if they had any Bacho 2444 knives and the guy said no they don't stock them anymore. I didn't have time to go to Mitre 10 but I was wondering if anyone knows if they still stock them? I managed to find them at farmlands for $13!! !